You may think you know his story but did you know he visited Hagerstown?! In 1879 Douglass took a train to “Hub City” where he delivered an address to benefit Bethel African Methodist Episcopal Church. Future United States Congressman and United States Senator, Hagerstonian Louis E. McComas introduced Douglass before he spoke at the courthouse on Washington Street. 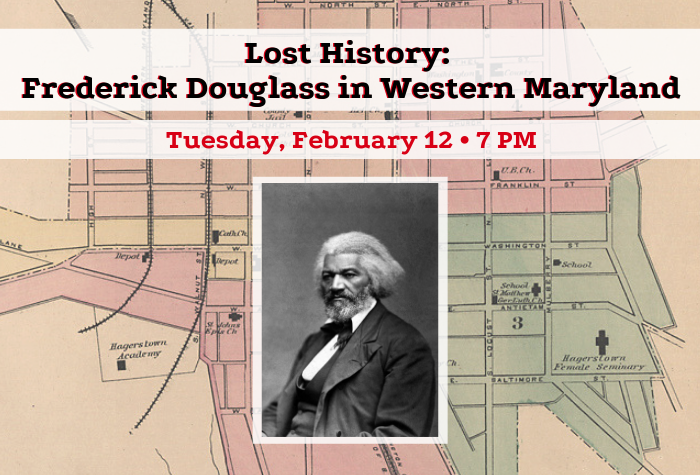 Hear historian and author John Muller share never before published details of Dr. Frederick Douglass’ visit to Hagerstown walking the community and lodging in the historic Washington House. Each presentation will be a half-hour history discussion. The Newcomer House is located approximately ½ mile east of Sharpsburg along Maryland Route 34 (Shepherdstown Pike) on the western edge of the Antietam Creek. Thank you to Hagerstown, Maryland (Hub City) for embracing and uplifting the consequential lost local history of Frederick Douglass! Walking tour of Hagerstown gathers on Bethel Street. John Brown in the cut. Corner of Henry Avenue and Bethel Street in Hagerstown, Maryland. The street is named for Rev. Thomas Henry, a legendary AME pastor in the greater Hagerstown area who had connections to Frederick Douglass and the greater Anacostia and Good Hope Communities of Southeast Washington. Jeff Cline, Washington County Commissioner, presents a proclamation recognizing the 1879 visit of Dr. Frederick Douglass to Hagerstown to an elder of Ebenezer AME Church, pastored by Rev. Marbury at 26 Bethel Street in Hagerstown, Maryland. Proceeds from Douglass’ 1879 lecture supported the church, a characteristic of hundreds of Douglass’ lectures in the last three decades of his life. On Bethel Street a historic marker recognizes the history of Hagerstown’s AME church before and during the Civil War. The connections between the AME church in networks of Hagerstown and Baltimore and Washington are numerous. An inquisitive young man reads from a historic marker noting John Brown’s 1859 stay at a hotel in downtown Hagerstown before launching his assault on the federal arsenal in Harpers Ferry, West Virginia. In preparation for two upcoming presentations in Hagerstown, Maryland about the lost history of Frederick Douglass visiting the “Hub City” in April 1879 I recently had the pleasure of offering a preview talk at Ebenezer AME Church at 26 Bethel Street and a preview walking tour. Special thanks to Mr. Ron Lytle of the African-American Historical Association of Western Maryland, Pastor Donald Marbury of Ebenezer AME, Commissioner Reggie Turner of the Maryland Commission on African-American History and Culture, Rachel Nichols of the Heart of the Civil War Heritage Area and the crew of the WDVM-TV for braving the elements. Additional thanks to Dan Spedden and his staff at the Hagerstown-Washington County Convention and Visitors Bureau. Looking forward to the upcoming television special and presentations Tuesday, February 12th at the Fletcher Branch Library in downtown Hagerstown at 7:00 PM and Saturday, February 16th at Ebenezer AME Church at 2:00 PM. In 1879 Douglass took a train to “Hub City” where he delivered an address to benefit the Bethel African Methodist Episcopal Church. 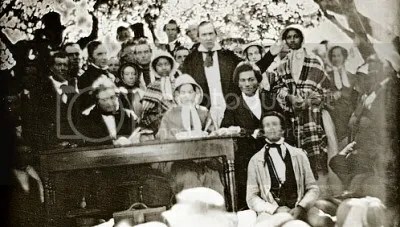 Future United States Congressman and United States Senator, Hagerstonian Louis E. McComas introduced Douglass before he spoke at the court house on Washington Street.